When Queen Bitterblue took the throne of Monsea, she was a child, and her advisers ran the kngdom for her. Now she is beginning to question their decisions, especially how they handle the legacy of her father Leck, who who ruled through his Grace--a special talent for mind-altering--and his taste for darkness and violence. Bitterblue needs to know Monsea's past to lead it into the future, so she begins exploring the city sreets at night, disguised and alone. As she does, she meets two thieves, who hold a key to the truth of Leck's reign. And one of them, with a Grace that he hasn't yet identified, holds a key to her heart. 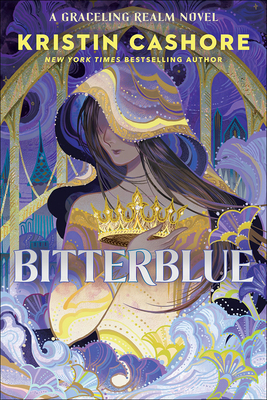 Bitterblue is unforgettable--a gateway to the Graceling Realm that braids together magic, memory, and romance. Kristin Cashore grew up in the northern Pennsylvania countryside, the second of four daughters. She received a bachelor's degree from Williams College and a master's from the Center of the Study of Children's Literature at Simmons College, and she has worked as a dog runner, a packer in a candy factory, an editorial assistant, a legal assistant, and a freelance writer. She has lived in many places (including Sydney, New York City, Boston, London, Austin, and Jacksonville, Florida), and she currently lives in the Boston area. Her interntaionally best-selling novels, Graceling and Fire, have received multiple starred reviews. Their awards and citations include being named ALA Best Books for Young Adults, Publishers Weekly Best Books of the Year, Booklist Editors' Choices, an Andre Norton Award Finalist (Graceling), and winner of the Amelia Elizabeth Walden Award (Fire). Kristin Cashore can be found online at kristincashore.blogspot.com, and on Twitter as @kristincashore.